"The Wheels on the Dog Go 'Round and 'Round" - During Corky's live "National Adopt a Pet Day" segment, she guilts Murphy into adopting a dog. Also, Avery's show is moved to the Wolf Network's plum 10:00 PM timeslot, and Phyllis and Miguel get a surprise visit from Fred Noonan (Peter Scolari), an intimidating health inspector, on MURPHY BROWN, Thursday, Dec. 6 (9:30-10:00 PM, ET/PT) on the CBS Television Network. 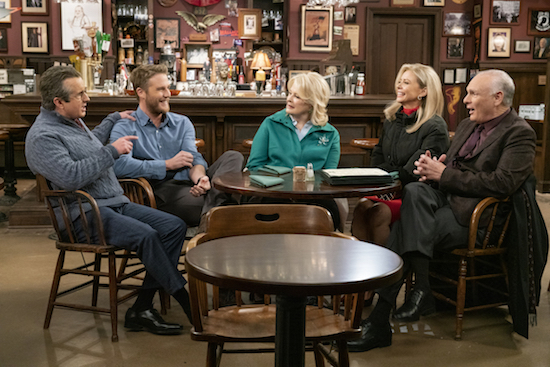 Pictured L-R: Grant Shaud as Miles Silverberg, Jake McDorman as Avery Brown, Candice Bergen as Murphy Brown, Faith Ford as Corky Sherwood, and Joe Regalbuto as Frank Fontana Photo: David Geisbrecht/CBS ÃÂ©2018 CBS Broadcasting Inc. All Rights Reserved.